This work will not be entirely unknown to those who have studied the War of 1812 in America and Canada; but I believe a thorough investigation of this account is badly overdue as it is not always viewed by some as a reliable source. Shadrach Byfield was born near Bradford on Avon in Wiltshire to Aaron and Martha (nee Hart) who were weavers and were married in 1781 at Morgans Hill Independent Chapel. They had nine children all told, Abraham born 26 November 1782; Isaac baptised 18 April 1784; Jacob born 27 January 1785; Charlotte born 27 October 1786 – died at age of 3; Sarah born 19 January 1788; Naomi 24 December 1788, Shadrach born on 16 September in 1789, Lidya born 27 August 1791 and Ruth born 21 December 1796. The family generally followed into the weaving trade, following their parents, certainly Abraham and Jacob remained in the area throughout their lives and remained within the weaving business. However, Isaac and Shadrach would seem to have had other ideas, both leaving to join the army, Shadrach eventually following his elder brother into the 41st Foot. 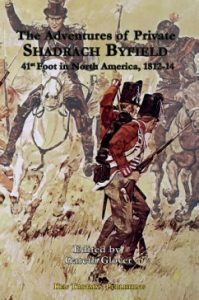 He was to serve his entire period in the army with the 41st in Canada and for much of this period, they were heavily involved in fighting the Americans, in the war known to history as the ‘War of 1812’ although it lasted from 1812 until early 1815. This war had occurred mostly because of clashes at sea between the Royal Navy and the American merchant fleet; the British trying to identify British seamen hiding out in American ships, whilst the Americans were unhappy with the high handed approach and imposition of trade embargoes by both the British and French navies. With Britain waging war with France, America also saw a golden opportunity to grab Canada whilst the British were distracted. The war was small scale by European standards, with few trained regular troops on either side (although Britain had more than the Americans), much of the fighting was carried out by small numbers of regulars, heavily bolstered by larger forces of only partially trained local militiamen and native Indians. The fighting was therefore more often fought in wooded areas in hilly terrain, difficult of access, often only reachable by boat along the rivers and Great lakes. But it was also a war fought at close quarters and often with great savagery, and not just by the Indians. It is this type of constant marching and fighting which Shadrach portrays so well and so accurately. There appear to be many who question the validity of his memoirs, because the evidence appears to support the fact that Shadrach may well have been illiterate, although he may have learned in later life. As a military historian, well versed in the soldier’s tales of the wars, I look for the supporting evidence to the claims made before I pass judgement. Shadrach certainly existed; he definitely joined the 41st Foot and fought in Canada as he claims. Almost all of the incidents he mentions can be verified from other sources and the eventual cause of his wound, the fact that his left forearm was amputated and his discharge from the army and pension granted are all proven. However, we have not yet answered the charge that he could not write and that therefore he could not have written it. It is abundantly clear to me that the end of his statement is noticeably different to most of those I have researched and this gives the clue to the answer – he almost certainly did not write them. The short passage recorded by Mr Edward Cooper Esquire, who owned Staveley Mill where he worked in 1840 recording that this is an honest record of Shadrach’s statement is the obvious key. Mr Cooper recorded Shadrach’s verbal statement, he or his clerk, actually recording his memories to paper on 1 January 1840. This is not so rare as one might think; I can easily recall two or three other examples of a soldier’s story being recorded for posterity by another, one such being Rifleman Harris, perhaps one of the most famous of them all, and nobody questions the validity of that memoir. There is therefore no legitimate reason to deny the validity of this account by a private soldier in Canada during the War of 1812. I can heartily recommend it as both a jolly good read, but also an accurate, warts and all portrait, of life of a soldier fighting in Canada at this time. I have done little to the text of Shadrach’s original statement other than to correct a very small number of obvious typographical errors; I have retained the text in the same order despite at one stage him getting things out of chronological order (where I have simply noted the error, not surprising for an account written 25 years after the events described). I did not want to disrupt the flow of his account and therefore I have retained my comments and placed them all in copious footnotes, to be read as the reader prefers. His name is often misspelt using the normal spelling of Shadrack; however his baptismal record and his own record on leaving the army, clearly shows his name spelt as Shadrach. He was not baptised until 1891 at the same time as Lidya and this has caused some to mistake his birth year despite his own statement, his actual date of birth of 16 September in 1789 is only recorded in his own statement, but there is no reason to doubt it..